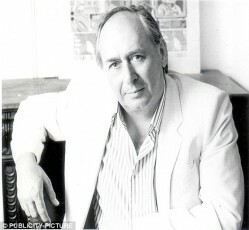 J. G. Ballard, who died in 2009 at the age of 78, was one of the greatest of all British speculative fiction writers, and one of the major writers of the period known as the British New Wave. His fictionalized memoir Empire of the Sun, was turned into a film by Steven Spielberg, introducing a young actor named Christian Bale. On May 8th, 1988, the Probabilities crew (Lawrence Davidson, Richard A. Lupoff and Richard Wolinsky) had a chance to sit down with J. G. Ballard while he was on tour for his novel, The Day of Creation. His novel, High Rise, comes out as a film in May, 2016. This program was digitized, remastered and re-edited by Richard Wolinsky in 2016.